About a week ago I went for a “routine” procedure. When I arrived at the specialist’s office I followed my directions, I stripped naked from the waist down, laid on the table and left my baby maker out in the open for the world to see. I wasn’t uncomfortable with the procedure until this very moment. About 10 minutes later 2 women entered, the one who was going to perform the procedure was a student. For the next 30 min I was handled, squeezed and examined. All of a sudden this routine procedure turned very invasive. I started thinking of all the times I’ve had patients in the back of my ambulance whom I started 12 leads, IVs or intubated, all routine procedures. When most of us go to work we’re going to start more IVs than people will have cups of coffee that day. My point is what seems routine to us may be a terrifying experience for our patients. I think it’s important to maintain a level of compassion for our patients. It may be the 5th IV you’ve started that day but the first ever for your patient. 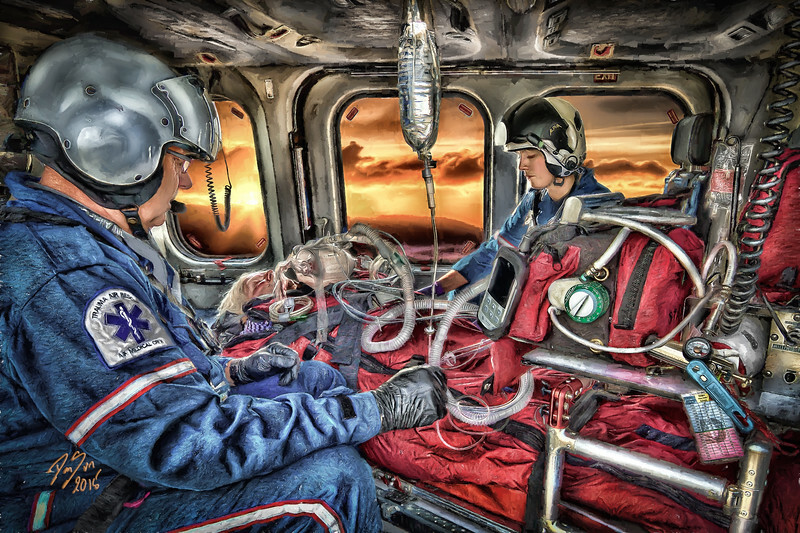 I’ve been wanting to do a Flight Nurse and Medic piece for a long time and this image illustrates my point very well. Imagine on top of the IV, 12 lead, medications and the initial injury or medical condition you will now be flying in a helicopter or small plane. Flying alone can be terrifying for many people. Thank you everyone for your continued support. Be safe and take care of each other.